There is nothing quite like the allure of a rustic wood cabin set among a backdrop of dense green woods and mountain views. With the Beech Mountain cabins for sale through Antler Realty, your vacation can become your home. The expert real estate agents at Antler Realty are ready to collaborate with you to find the perfect mountain cabin. Whether you want to make Beech Mountain your new home, or you are interested in purchasing a summer getaway or winter ski cabin, our real estate team will work tirelessly until we find you a property that fits your needs and budget. The Blue Ridge Mountains are not only rich in scenery and wildlife, but are also privy to some of the most luxurious and high-end cabins in the High Country. Antler Realty can help you and your family explore the Beech Mountain cabins for sale to find a property that is modern, but not devoid of that mountain cabin charm. Leave the ruffin’ it to the Appalachian Trail hikers, and work with Antler Realty to find your luxury mountain cabin in Beech Mountain or the surrounding area. 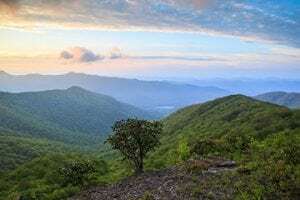 Beech Mountain is a place for everyone, and Antler Realty can find an off-the-grid property or cabin that will satisfy your adventuring spirit. Let Antler Realty help you stay connected to nature by purchasing a cabin of your own. When you work with Antler Realty, our agents are committed to understanding your unique and individual needs. Antler Realty is dedicated to finding our clients more than a cabin, we want to find them a home. In this vein, our agents will work tirelessly to match the unique needs and desires of our clients to the style and quirks of all the Beech Mountain cabins for sale. Whether you are in the market for a high-end luxury cabin that will offer you and your family the most modern amenities, or you desire for your cabin to remind you of the simple things in life, Antler Realty provides our clients service that is second to none. Contact Antler Realty today to speak with one of our expert agents, and ask to see some of the Beech Mountain cabins for sale.